I see dozens of weekly blogs about What I Ate Wednesday. It has always confused me. I would see pictures of breakfast, lunch, dinner and snacks, supposedly consumed on Wednesday, posted on Wednesday morning?! Either these bloggers are real hungry or I’m missing something. ON. That’s what I was missing…or not. It’s What I Ate Wednesday, not What I Ate ON Wednesday. I get it now. So what I’ll show you here, is what I ate Tuesday. 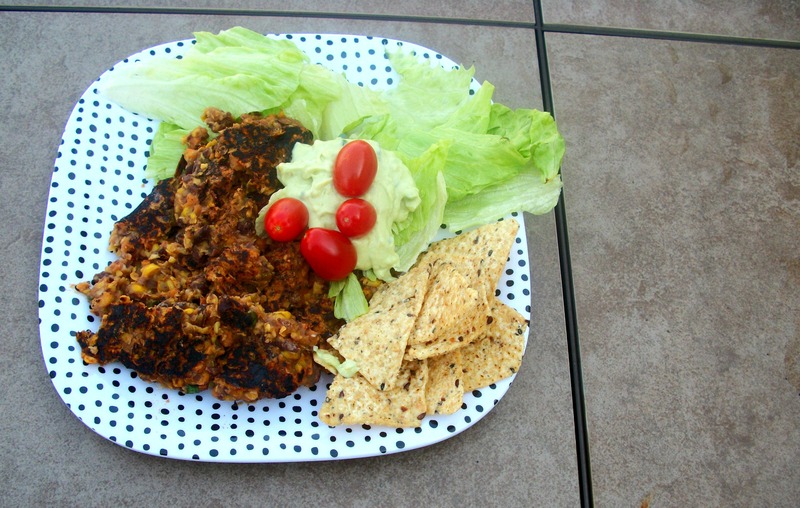 Tuesday Breakfast– Leftover Black Bean Burger (it kinda fell apart this time but seemed more breakfast appropriate this way) with Avocado Cream, Garden of Eatin’ Multigrain Everything Chips with Flax (LOVE THESE! ), and some lettuce and tomatoes for good measure. Lunch on Tuesday was also enjoyed outdoors. 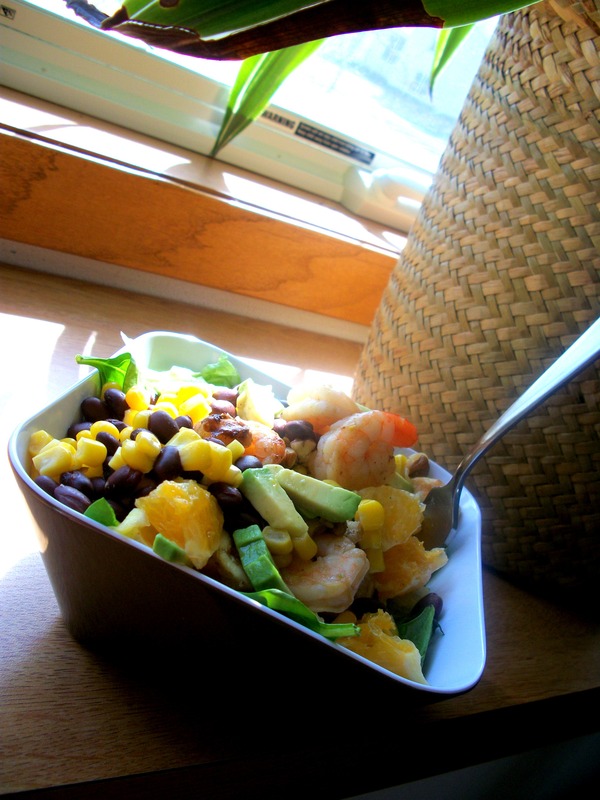 I used up leftover shrimp from Sunday, leftover black beans, corn, and avocado from my Meatless Monday. To dress this springy salad, I used the juice of half an orange and one lime, along with a tablespoon of light agave nectar. I used a whisk to mix it all up, then poured it over the shrimp, black beans and corn, after warming them up in a pan over medium heat. 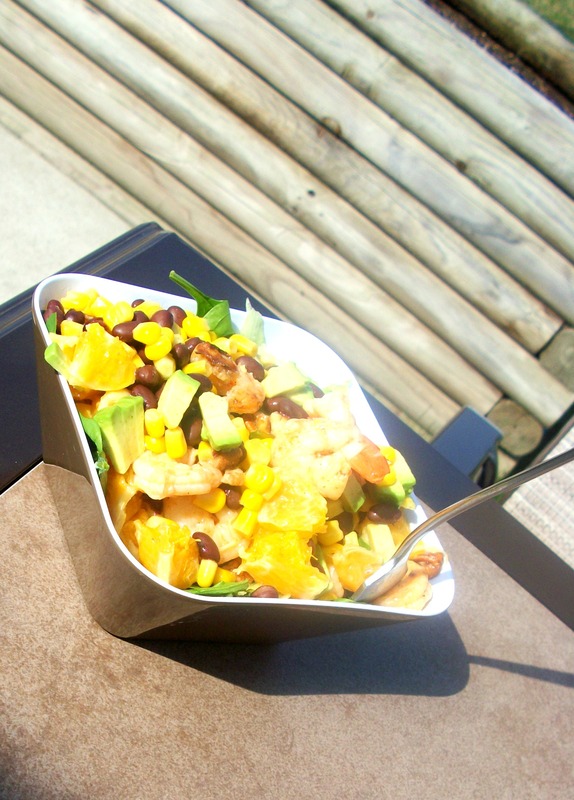 I then placed the shrimp, beans and corn atop a bed of mixed greens. I promise there are greens under all of that goodness. I cubed the other half of avocado, chunked the other half orange, and threw it on top of the salad with a few pecans. Almonds would’ve been perfect but pecans were all I had on hand. 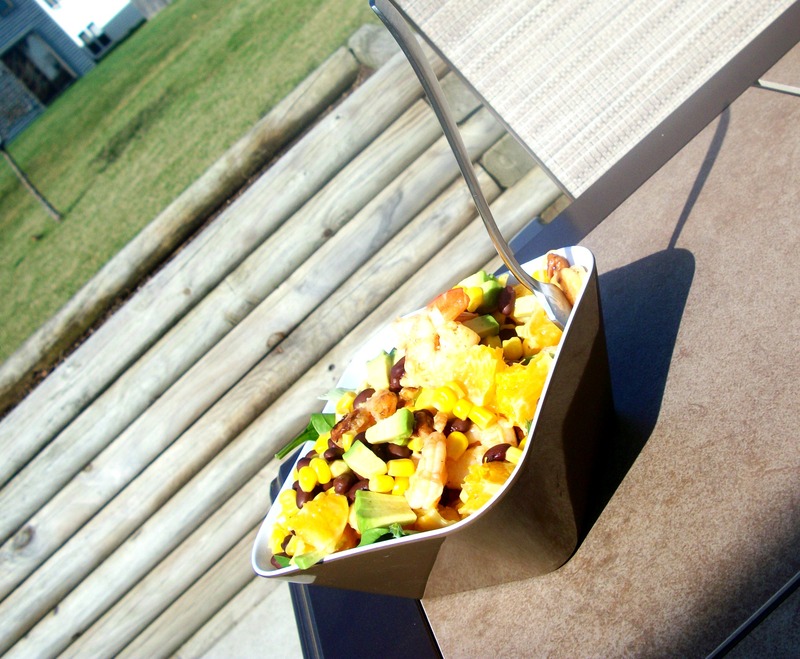 This salad was SO good! I almost drank the dressing from the bottom of the bowl. Almost. 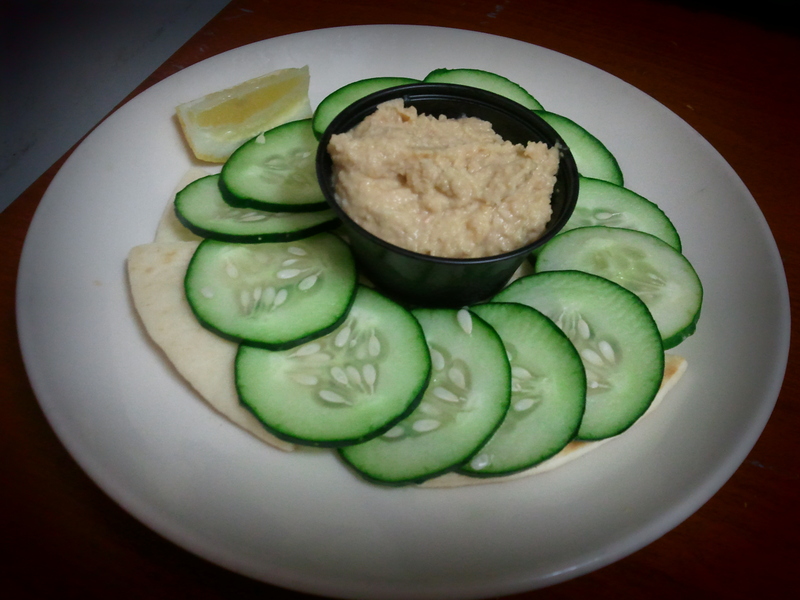 Dinner on Tuesday night was more hummus (I’m on a kick!) I skipped all the other veggies this time and just had the cucumbers. I also had a handful of fried calamari that I chose not to photograph because I knew, even before eating it, that I would feel awful afterward. I did. I also snacked on a few Wavy Lays potato chips throughout the day. Luckily I stopped at the grocery store today for some healthier snack options. Though I will say that when I have healthier snacks around, I tend to eat even more of them because well, they’re “healthy”, right? I woke up early this morning and took Fielder for a nice, long walk. 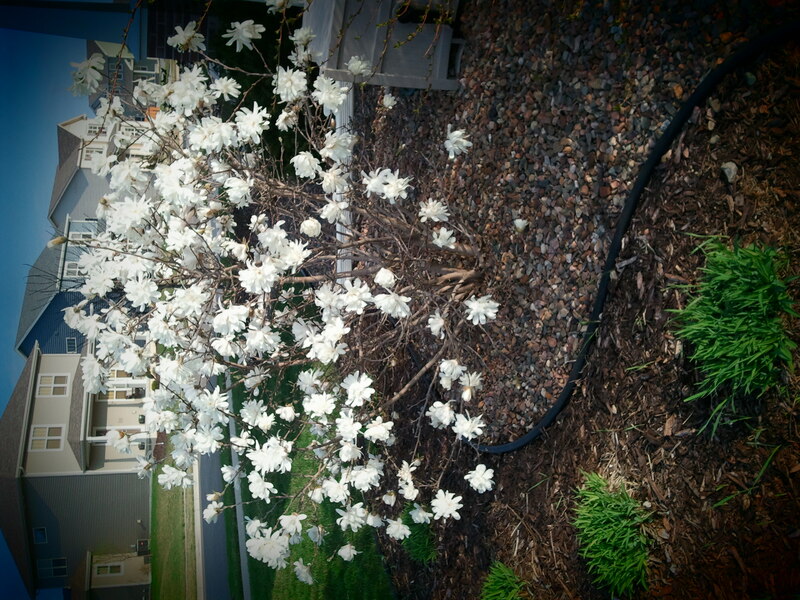 We were both stoked to see all of the beautiful blooms throughout the neighborhood. 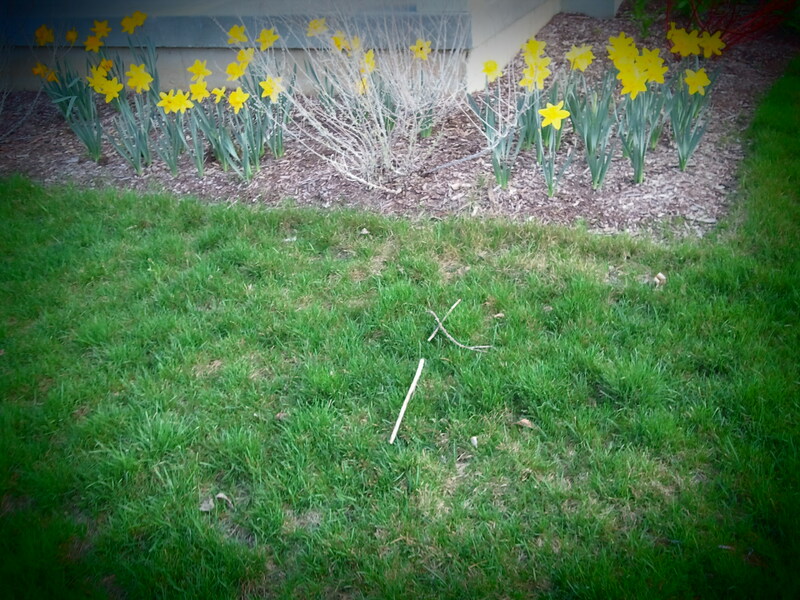 Some pretty yellow flowers…daffodils, right? Also quite a bit of (green!) grass in this pic. Didn’t want these homeowners thinking I was being a creeper or anything. After work tonight I took Fielder for another walk, he loves this weather as much as his momma. Inspired by Corey, I decided to make zucchini “pasta” tonight. It was FANtastic and could NOT have been easier. Since this is getting long, I’ll share with you how I made it tomorrow, but for now I’ll leave you with a pic. Tonight I also did my first official Couch to 5k run. Well, half of it at least. Fielder got tired and wasn’t cooperating so I only did half but it was nice to get to know the phone app a little better. After that, I got caught up on One Tree Hill. Am I the only one still watching this show? Probably. At least the only person over the age of 21. I don’t care. I love it. I started watching from the very beginning and will watch it ’til the very end. Which, unfortunately is in 2 weeks. I’ve cried at every episode this season so far, especially tonight. I can’t even imagine what a mess I’ll be when I watch the series finale. I’m not ready to say goodbye to Tree Hill, the Ravens, all of the beautiful darn people on that show! I heard that Sophia Bush has a show coming to CBS though so at least I can see one of those beautiful people on a regular basis after the finale! Have you ever watched a series from beginning to end and felt soooo sad to see it go? Nowadays with TiVo, DVR, OnDemand, NetFlix, shows on DVD, etc. it’s really easy to watch an entire TV series, even in a matter of weeks. But back in the days before all of that fancy stuff, I lived for Dawson’s Creek, Beverly Hills, 90210, and bunches of other shows that I would either drop everything to watch, or record on VHS. VHS?! Ahhh, those were the days. I’ve also watched Felicity from start to finish, uh, multiple times. The entire series aired (I believe four times) on We, one episode per day, twice a day. I don’t know how I happend upon it but I watched, and watched, and watched. Love that show. 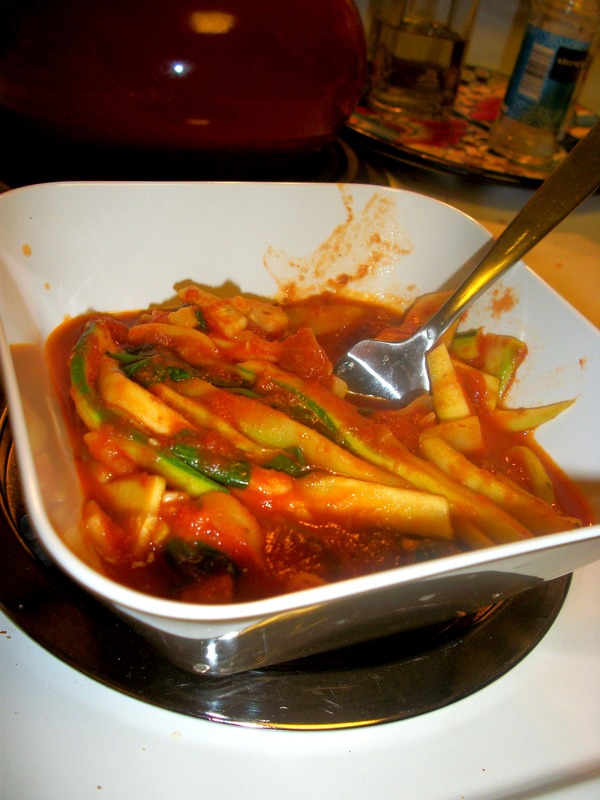 LOVE how much you LOVE zucchini pasta….. me too. I can already tell we are going to become awesome friends!